"The hardest part about writing a novel is finishing it." 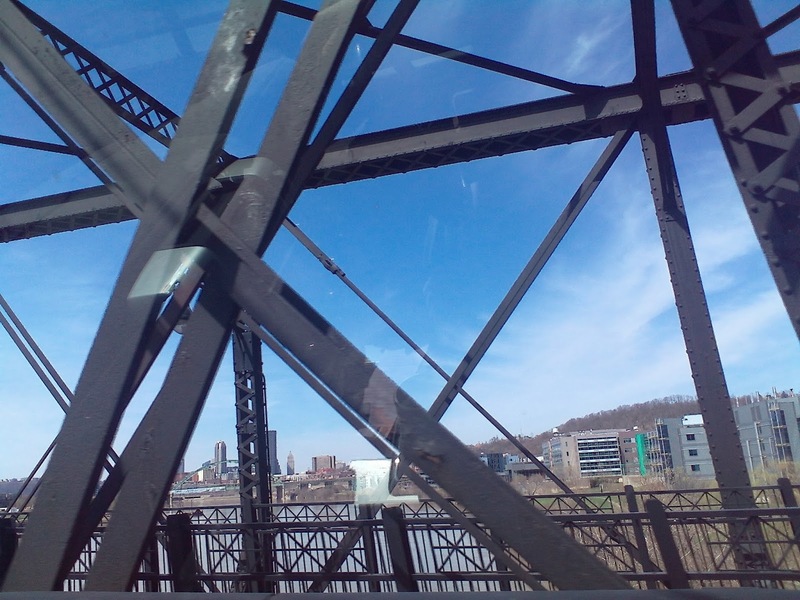 Writing a well-constructed novel is much like putting a river-spanning bridge together. If you miss a piece, your reader is likely to slip through your grasp and be disconnected from your virtual world. It can be hard for an author to know when we've missed a pertinent piece since we know the story backward and forward. The piece is already in our head. We know where and how it fits. Translating it is the problem. Since readers can't see inside our heads, we have to be sure to get it in words. I always get somewhat nervous about writing The End (figuratively). Did I get everything in that needs to be there? Do I have extraneous stuff I should take out so I don't take more of the reader's time than needed? The big trick is not stopping too soon, but also stopping soon enough. It's the same as with painting. Recently, I've gone back to my art. I've never done a lot of painting; mainly I've worked with pencil and charcoal. 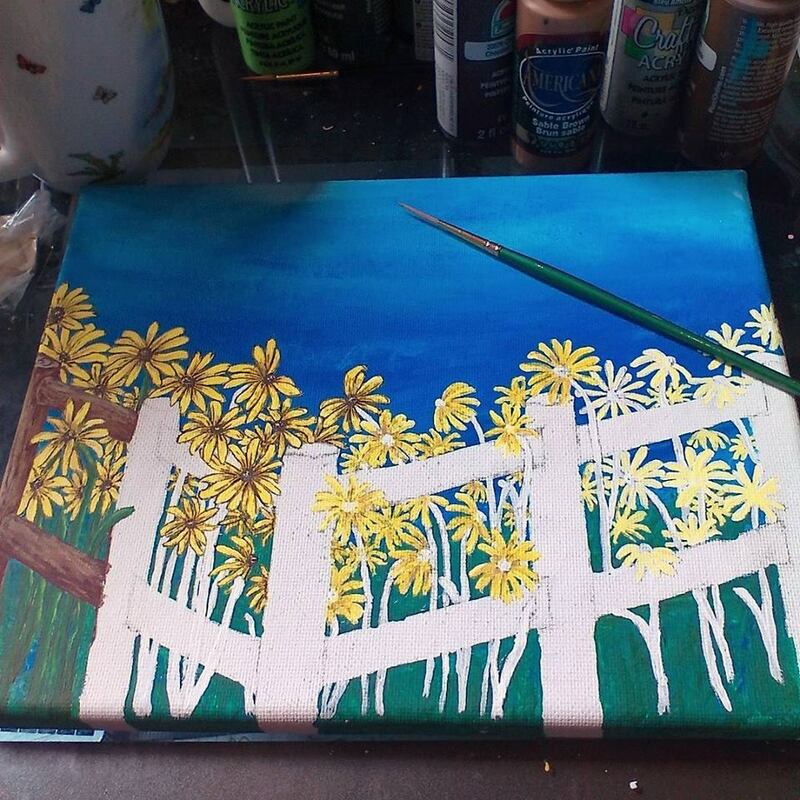 So while I'm not a novice artist, exactly, I'm a fairly novice painter. While I worked on my latest piece, I could feel the similarities with the way I build a story. 1) Get the basics down. a) With painting, that means put a rough sketch on the canvas so I know where I'm heading. b) With writing, that means get the first rough draft of a story on paper. 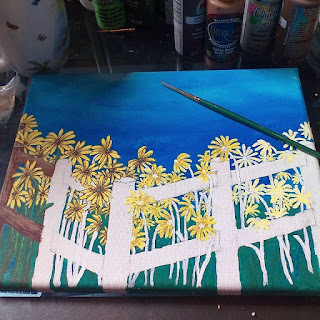 a) Since I was painting a fence with Black-Eyed Susans, even though I know generally what they look like as seen from a road, I looked them up to find the detail I needed to make them realistic. b) My current WIP (work in progress) is set in Williamstown, WV, so I did internet and in-person research to make sure my characters were living in a realistic setting. 3) Add in the bulk. 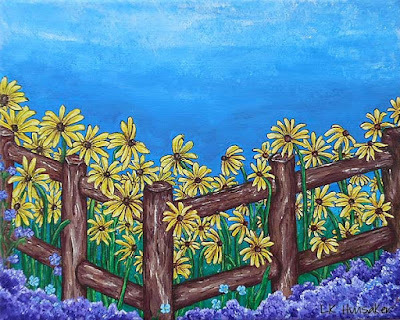 a) The next step in the painting was to build up the background by adding the main parts: the sky and the grass behind the flowers, the basic brown of the wood fence, the basic green and yellow of the flowers. b) In the story, this step means filling in some backstory, adding personalized character traits, building up secondary characters, and plenty of note-taking/outlining to be sure it's still heading in a particular direction. 4. Fill in the little extras that make it pop. 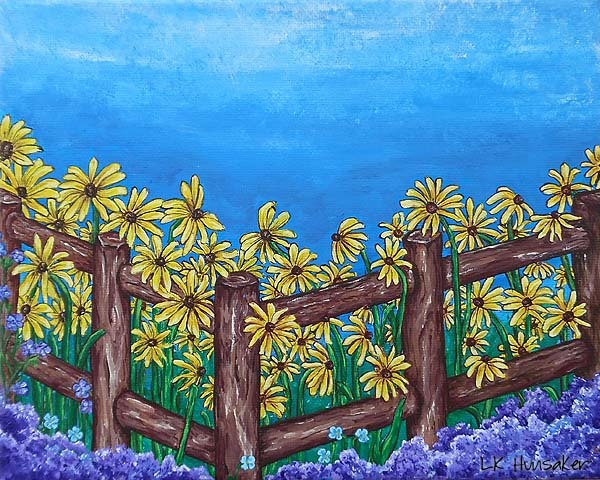 a) After I got the canvas filled in so I had a viable painting of Black Eyed Susans and a natural log fence (that transformed itself from the flat boards I planned to full round logs as I painted), I knew it wasn't done. It needed more pop. More variation. More color. So, I decided to add some purple flowers around the bottom. After adding those, I also added a few aqua straggler flowers meant to look like they decided to join the crowd unplanned. This added a fullness/completeness to the canvas. b) After I had the WIP fleshed out, it was time to read back through to try to eye it as a reader would and pick up on inconsistencies and missing pieces. It also meant changing sentence structures for better impact and clearing out too many repeated words and present participles (one of my personal writing things to watch) in order to help the flow. a) With this painting, I kept eyeing it thinking it wasn't quite right. It was a bit too cartoonish and not quite realistic enough. Finally, it struck me that I was missing the highlights. Yes, Black Eyed Susans are yellow and the shading helps to define their shape, but in the sunlight, parts of the petals appear more white than yellow. Ah. So I added highlights and voilá, more reality. While the painting is no Van Gogh or Monet, I'm happy with it as a good slightly-more-than-amateur effort. It's pretty enough to enjoy. b) With the WIP, I also kept thinking it wasn't quite right, even if I had hit "the end" and sent it out to a few beta readers. Something about it bothered me and so I couldn't release it. It sat for a while as I did other things, such as work on the painting, and then it came to me. The solution was similar, but far more complicated to fix. It ended too soon. As with a painting, you can't go on too long, but you can't cut it too short, either. You have to have those highlights. And so, the WIP went back to step #3 for a rework. It ended too fast, was resolved too quickly, and it wouldn't have. The story needed a somewhat bigger canvas. The hardest part of art is knowing when to keep going and when to stop and say The End. Only the viewer/reader can truly say whether that happened at just the right point. For the creator, it's truly subjective since we can see where we were trying to go whether or not it got where we intended. Once it has a life of its own, the impact it creates is far beyond our control. That's not an easy thing, either, but that's another story. 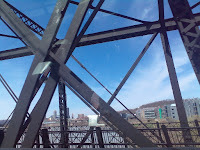 For a final image of the WIP, check out Shadows of Rust & Reels by Ella M. Kaye once it's published. 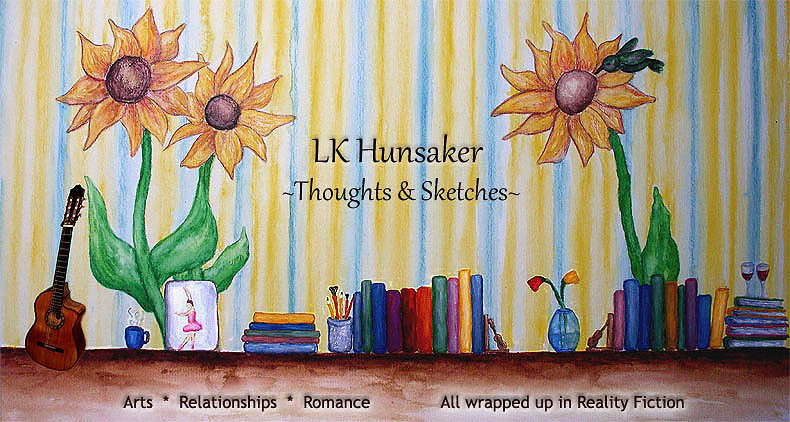 It's part of the Artists & Cottages series.